In spite of its latest controversy, Apple is not backing down. Many Apple fans were none too pleased to learn the company was removing the standard headphone jack from the upcoming iPhone 7, forcing users to either buy pricy wireless earbuds or carry around an extra adapter. Some say Apple went too far with the product shake-up, but its CEO’s latest actions prove that the company is doubling down on the new design: Tim Cook just had the only iPhone 7 headphone jack surgically installed into his abdomen. Wow. Talk about Apple totally laying down the law. Tim Cook made the big announcement at the company’s Cupertino headquarters early this morning. 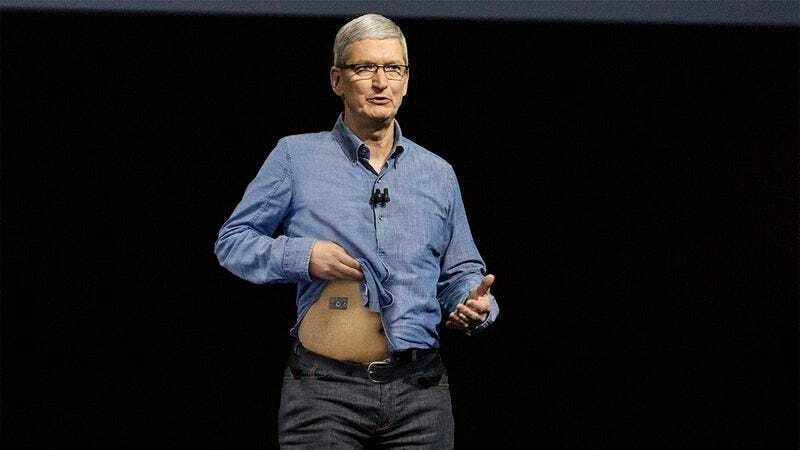 He walked on stage in front of assembled press and immediately lifted his shirt to reveal a 3.5 mm headphone jack carefully sutured into the flesh above his navel. After showing it wordlessly for several minutes, Cook made it absolutely clear that this was the last headphone jack the company would ever produce with a thundering invective. Love or hate the fact that everyone seeking to use an iPhone headphone jack must now fly to the Bay Area and plug into Tim Cook’s abdomen, this is undeniably Apple showing that it is still the power player of the tech world. In a quickly changing industry, Apple just sent a crystal clear message to smartphone users everywhere: Get on board with wireless technology, or be prepared to plug your old-fashioned headphones right into Tim Cook’s stomach. Your move, Samsung.